As the world’s business and political elite ascends the Swiss Alps for an annual bout of crystal-ball gazing this week, history suggests the Davos pundits are likely to get plenty of things wrong. More than 1,500 business leaders and 40 heads of state or government will attend the 21-24 January meeting of the World Economic Forum (WEF) to network and discuss big themes, from the price of oil to the future of the Internet. This year they are meeting in the midst of upheaval, with security forces on heightened alert after attacks in Paris, the European Central Bank considering a radical government bond-buying programme and the safe-haven Swiss franc rocketing. The mountain air encourages confident pronouncements but the accuracy of Davos predictions has been mixed in recent years. Dud forecasts from last year include Bank of Japan chief Haruhiko Kuroda declaring the situation in his country was “completely changed”. Twelve months on, Japan’s economy is back in recession. And no-one last year saw Russia’s annexation of Crimea, the rise of Islamic State or oil at $50 a barrel. The twin crises in the euro zone and the banking sector have also been notorious for wrong-footing policymakers and pundits. In 2011 the French finance minister at the time, Christine Lagarde, declared the euro zone had “turned the corner” and told financial markets not to “short Europe”. The bloc went on to have an awful year in which short-selling would have been a decidedly smart tactic. In 2012 the tables were turned when economist Nouriel Roubini, nicknamed Dr Doom after he forecast the US sub-prime mortgage crisis, predicted that Greece would leave the euro within a year. It didn’t happen, though “Grexit” talk is back on the agenda in time for this year’s Davos shindig. The nadir for predictions, however, was January 2008. 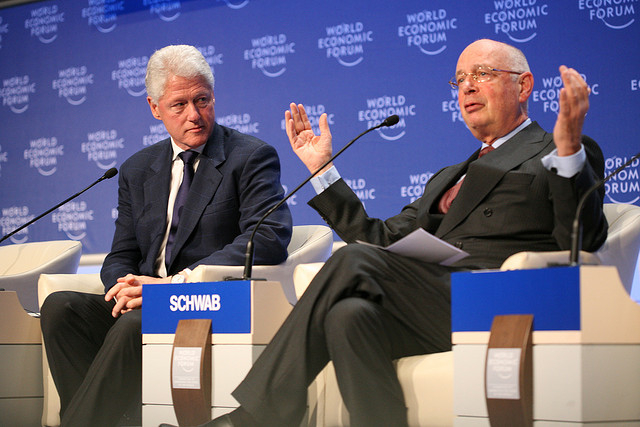 Despite the onset of the U.S. sub-prime crisis, the Davos crowd overwhelmingly failed to spot the coming crash sparked by the collapse of Lehman Brothers only eight months later. A comment from Kuwait Investment Authority head Bader Al Sa’ad that bargains in the U.S. financial sector represented “a pure investment opportunity” summed up the overconfident mood at the time. In the technology world, Microsoft co-founder Bill Gates famously promised in 2004 to rid the world of spam email within two years. The world’s three billion Internet users are still waiting. But Davos has been good at spotting some mega-trends, such as the rise of emerging markets and, more recently, the shale gas-driven rebalancing of economic growth in the United States. It also flagged future global tensions, such as access to water and cybersecurity. The Alpine zeitgeist has a better track record when viewed from the perspective of the business community as a whole. An annual survey of confidence among chief executives, unveiled each year at Davos by PricewaterhouseCoopers, shows that CEOs had a reasonably good idea of what was in store in 2007, 2009 and over the past three years, if not in 2008 and 2011. Of course, for most of the 2,500 participants, the event is more about meeting contacts and swapping ideas than pinning down firm predictions. This year worries about international conflict are a major concern for the global community, according the WEF’s annual Global Risks report, though economic fears are still very real.